I have to hand it to OCZ's CEO, Ryan Petersen, I never thought he'd turn the company around in the way that he did. When I first met Ryan around a decade ago, he wanted to know why I wouldn't allow him to advertise OCZ on AnandTech. The company at that time had an extremely bad reputation. It was among the worst I'd ever seen. It was so bad that not only would we not review their products (memory, at the time) but I wouldn't allow OCZ ads to run on the site. Although all advertising on AnandTech is handled through a third party, I still have the ultimate say on what ends up on the site. Back then, OCZ wasn't allowed. Having just taken over the company, Ryan was eager to know what he had to change to fix OCZ's reputation. I gave him a long list of issues to address. Most of my suggestions were obvious, just to go above and beyond the call of duty in taking care of his customers and our readers. He agreed to do everything on the list, with one exception. I told him that if he really wanted to succeed, he needed to abandon the OCZ name and start fresh. He told me that he didn't believe it was necessary. We agreed to disagree. I remember leaving that meeting thinking that Ryan didn't stand a chance. Memory companies were a dime a dozen. Differentiation was bordering on impossible. Having to overcome a bad reputation on top of that didn't make things any easier. Ryan is headstrong. He'll sow a bunch of seed with the hopes of seeing just one blade of grass grow. I consider myself an optimist, but he's a different breed of one. He's had his share of failures over the years. Remember the OCZ brain mouse? The foray into notebook PCs? No one ever succeeded without trying. Since then OCZ has abandoned memory altogether. It focuses on two product lines: power supplies and SSDs, the latter making up the bulk of its revenue. 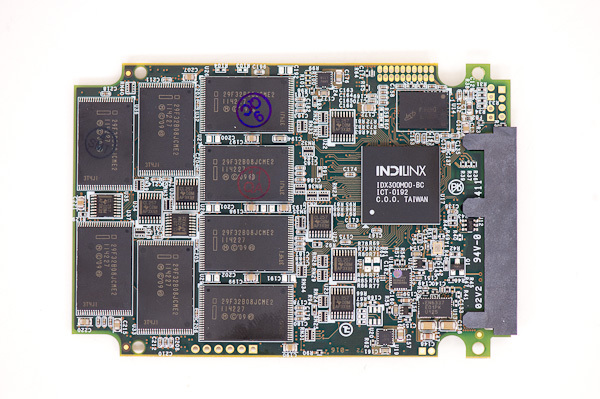 And earlier this year, OCZ bought one of the first high-performance SSD controller manufacturers - Indilinx. OCZ's strategy there didn't make sense to me. I knew Ryan wanted to buy SandForce, but SF was too expensive. I asked Ryan why bother with Indilinx if what he really wanted was SandForce? He told me that the best way to drive the price down on SF was to buy Indilinx. It didn't add up until now. Ryan took a big risk on Indilinx. They had a promising controller in 2009 and he bought up the bulk of what they could make in exchange for exclusivity rights. 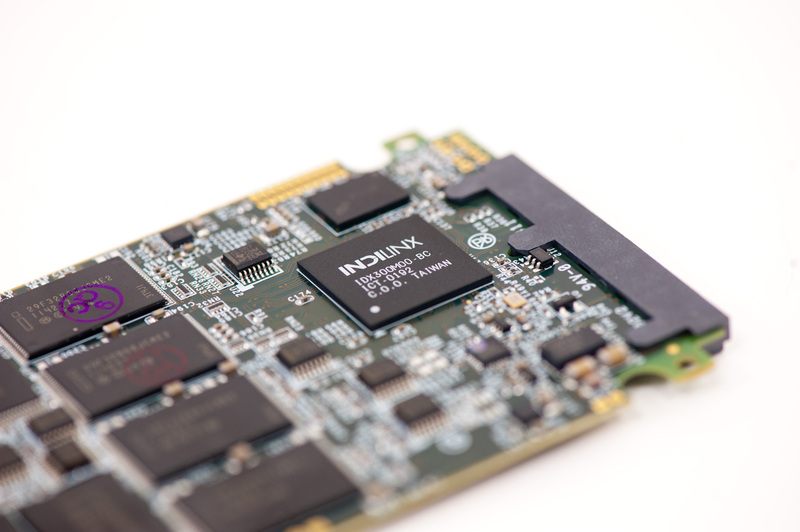 OCZ made Indilinx, and Indilinx made OCZ. As Indilinx began courting more vendors, OCZ went after SandForce. As soon as a first generation controller was ready, OCZ began shifting its volume from Indilinx to SandForce. More partners stepped up to fill the gap left by OCZ, but by then no one wanted Indilinx - they wanted SandForce based drives. Simultaneously (perhaps a result?) Indilinx's execution suffered, the stumble was irrecoverable. The value of Indilinx went down, and Ryan got the company for cheap. I can only assume the strategy was to rinse and repeat. I had heard rumors of OCZ working on its own controller for the past two years. The Indilinx acquisition sped things up considerably. 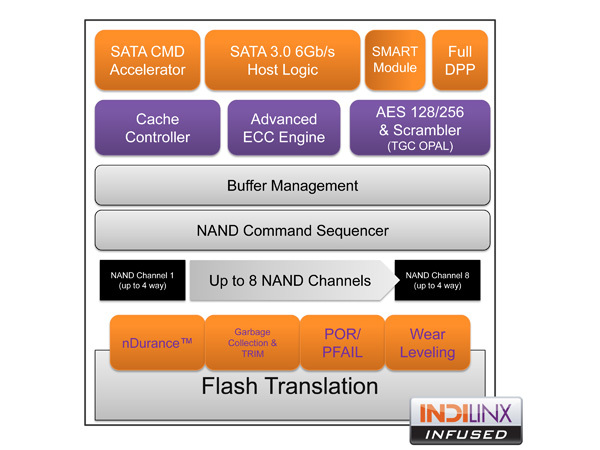 If the Indilinx solution was good enough, OCZ would shift its volume away from SandForce to its own controller. Starve SandForce and swoop back in later to buy them at a more reasonable price. Competition makes for competitive prices on both sides of the fence it seems. Things of course didn't work out that way. OCZ took a while to get its own controller design done and it was still very dependent on SandForce. At the same time, SandForce had diversified its portfolio. Since the announcement of the Indilinx acquisition, SandForce brought on a number of new partners to sell its drives. Even Kingston signed up. Finally, LSI agreed to purchase SandForce at a number well in the range of what SF was looking to sell for. 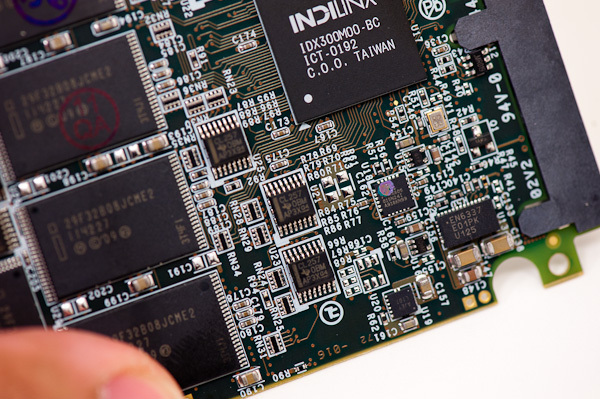 There's not much we can tell from looking at the silkscreen on the IC, but it's the first all new SSD controller from Indilinx since 2009. Jetstream was its predecessor, but that part never made it to market. Everest is Indilinx's first 6Gbps controller and its delivery vehicle is the OCZ Octane SSD. You'll see both 6Gbps and 3Gbps versions of the drive, although what's launching today is the 6Gbps part. If these MSRPs are accurate, the Octane will be price competitive with Crucial's m4 and Samsung's SSD 830. I've learned not to trust early MSRPs when it comes to SSDs so we'll have to just wait and see. I think it's safe to say that with OCZ making the controller, we should see lower prices than OCZ's SandForce based drives. Ultimately SSDs are gated by the price of the NAND, which OCZ's Indilinx acquisition does nothing for. The 6Gbps drive uses Intel 25nm 2-bit-per-cell MLC synchronous NAND, similar to what you'd find in a Vertex 3. OCZ sent us a 512GB version with sixteen NAND packages and four 8GB die per package. We typically don't see any interleaving benefits beyond two die per package, so I'd expect similar performance between the 512GB drive and the 256GB version (despite the significant difference in specs). Spare area is pretty standard at around 7% of the drive's total NAND. The Octane PCB is interesting to look at. While OCZ has a history of building its own PCBs, this is the first time that we have an SSD where both the PCB and controller are made by OCZ. The controller-side of the Octane PCB is home to eight TI muxes. OCZ wouldn't tell me their purpose, but I suspect it has to do with enabling interleaving across all of the available NAND packages. With only eight channels directly connected to the controller, accessing more than eight packages will inevitably require some pipelining/interleaving. In typical SSDs I assume that the muxes (switches) to juggle multiple NAND die or packages are internal to the controller. My guess is that OCZ moved them external with Everest, although I'm not entirely sure why. It's also possible that this is somehow related to OCZ's ability to deliver a 1TB version of the drive. All Octane drives will have a 512MB DRAM cache split into two 256MB chips. OCZ's experience in buying DRAM in bulk from its days as a memory vendor likely comes in handy with securing such a large amount of memory per drive. The amount of cache in use will depend on the capacity of the drive. Larger drives have more LBAs to map to NAND pages, and thus require larger page mapping tables. OCZ is clearly storing user data in the Octane's on-board DRAM (hence the large size). The verdict isn't out on whether or not this is a good idea. Intel prides itself on not storing any user data in DRAM (only in on-chip caches), while SandForce's technology negates the need for any external DRAMs at all. On the other hand, the Marvell based solutions (e.g. Crucial m4) or Samsung's own controller both keep user data in on-board DRAM. Switching between architectures requires a lot of firmware work and as long as performance can be maintained, I see no reason to choose one over the other. There's always the risk of power related data loss, but that's more of a concern for enterprise customers. I couldn't get a straight answer as to whether data stored to NAND was encrypted in real time on the Octane or not. I'm going to assume that hardware encryption isn't working until I hear otherwise. The Octane comes with OCZ's usual toolbox for secure erasing/updating firmware. Both of those processes are very simple thanks to the utility. Unfortunately OCZ is still unable to get the toolbox working if you have Intel's RST driver installed, which significantly diminishes the usability of the software. 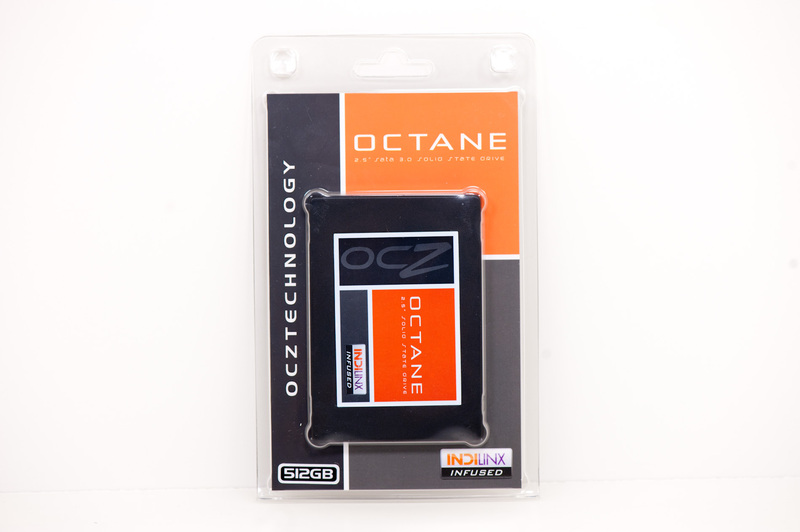 Testing OCZ's Octane proved flawless in the short period of time I've had with the drive. That's not saying much other than there's no obvious firmware issues with the drive. The Octane will ship with firmware revision 1315, which is the same firmware revision I tested with. Reliability is very important, performance and price are as well of course but without reliability the later two does not really matter. Like to see what diff the newwest Intel vs AMD controllers are. I would love to see a lot more tests runs on SSDs with less storage. Many of the drives have higher performance in the higher capacity models, and it's pretty obvious that your even your above average tech savvy user isn't going to be dishing out one thousand dollars for the 512GB version of the drive.